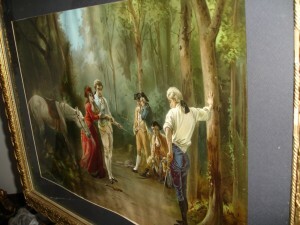 Twixt Love and Honor/The Duel, chromolithograph from a painting by Laslett John Pott. The first story I remember writing was called “The Burglar and the Bear.” It was written with cherry-scented markers on notebook paper, and I was in second grade. I’m pretty sure I remember the genesis of this story, too — a jar you could pull story prompts out of in my second-grade classroom. It might have been part of the ongoing project where we created our own “anthology” in a blank journal we were given — or maybe that was third grade. Either way, I kept at it even when I wasn’t getting graded on it. At around the same time, I started playing a game with other girls in my class during recess; we would pretend we were dogs, living under a picnic bench, which happened to be in Alaska. (I don’t even know). We were each different breeds of dogs, most of which we knew of thanks to pages of full-color photographs of different breeds in the school library’s encyclopedias. I think I was a beagle. Someone else picked an Alaskan malamute, because I guess a Siberian husky wasn’t interesting enough? Eventually I started writing them down, because if they were entertaining enough to play out once, they were entertaining enough to read about later, right? When my dad was visiting recently, I spent a long time sitting in my car in the parking lot of the Home Depot, reading. Far from being unpleasant, it was a nostalgic feeling (and definitely preferable to spending an hour arguing with Matt and my father about cement). Why was this so comfortable for me? It reminded me of the number of times I stayed behind in the car as a child. Not through any neglect on the part my parents, understand. We traveled a lot by car, because plane tickets were often out of reach. My parents were also antique dealers, so we stopped at every garage, rummage, tag, yard, or estate sale we found, as well as every fleamarket and antique shop. When a ten-year-old nerdy girl gets bored of staring at Depression glass, she goes back to her books. And my books were in the car. And we lived in an era in which it wasn’t seen as vast neglect to do this. Dude, the windows (and doors) were open, I wasn’t suffocating. I was happy reading Marion Zimmer Bradley while my parents “invested” in boxes of heat-resistant chocolate bars from the first Gulf War. This was one way in which I coped with the stuff my parents found interesting and I found boring. (Another way was building stories from the paintings and knick-knacks and furniture that surrounded me–pretending I was a princess in a nebulous fantasy-land composed of netsuke, ruby flash souvenir glass, faux-ormolu clocks and cigar-box Romantic art. That’s the next anecdote). It was also how I managed stuff which was too much, emotionally, for me to handle. I remember sitting in the car in a cemetery in Connecticut at the burial of one of my parents’ friends, for example. 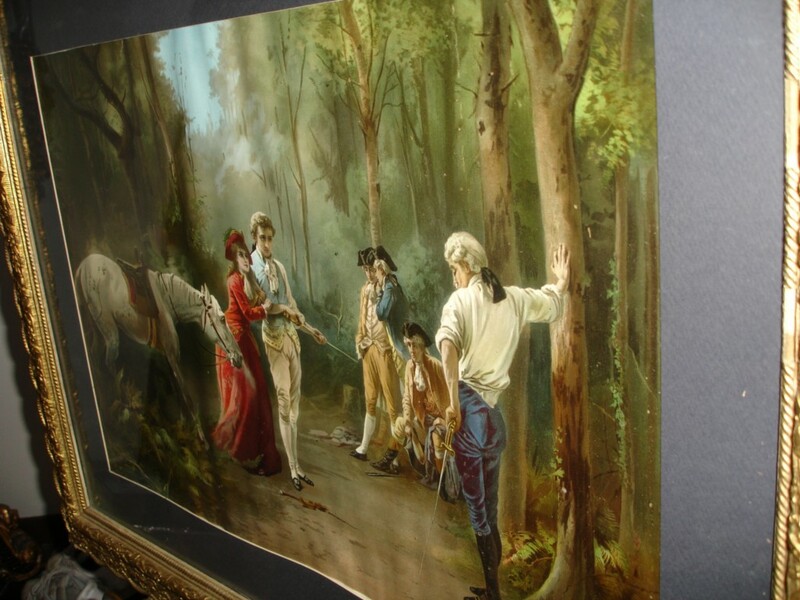 Over my seldom-used writing desk, I still have a print that used to be hanging in my mom’s antique shop — called “Twixt Love and Honor,” it depicts two 18th-century gentlemen about to duel over a woman’s honor. Recently, I researched the print, and found it was a chromolithograph based on an 1892 painting by Laslett Pott. (Which itself might have been a colorized version of an 1886 engraving called “The Duel”). In the late 19th century you could apparently send in 25 tobacco wrappers from the Wilson and McCalley Tobacco Company to purchase this or one of two other framed prints in the series. (I think they’re the ones who added the “TWIXT LOVE AND HONOR” text, as by all accounts that was not the name Pott gave the painting). I realize by any aesthetic standard, this isn’t a beautiful picture. For all I know, Pott could have been the Thomas Kinkade of his day, and the artifact itself is mass-produced, its frame and backing falling apart, faded with years of sun exposure. But it’s beautiful to me. It hangs over my writing desk because… this is where it all began. I distinctly remember walking around my mom’s antique shop before school one day (middle school), creating stories from the objects I found there. My story for this one was not quite the same as the one implied by the art; I was convinced it showed a couple being set upon by bandits at a crossroads. I didn’t even notice the print’s name; I only learned it when I asked my mom, “remember that print that used to hang in your shop…?” At that time, she told me she’d never sold it, and sent it on to me. I’m not sure what the point of this post is, but these are three stories about stories, remnants of my youth, that I wanted to share. What are your early memories of stories?